Edificio Kavanagh - one of the best Buenos Aires attractions, an engineering marvel of its time: see facts and stories behind its origins. Edificio Kavanagh is located at 1065 Florida St. By the time it was inaugurated in 1936, the Kavanagh Building was the highest skyscraper in Latin America and the largest structure made of reinforced concrete in the world. Commissioned in 1934 by Corina Kavanagh – it was designed by local architects Giorgio Sanchez, Ernesto Lagos and Luis Maria de la Torre. Its eclectic design represents the mixture of an early Argentinean Modernism and Art-Deco styles combined with the Rationalist approach to create the comfortable living space in a slim and “light” structure. At the time it was a revolutionary design staying in a sharp contrast with surrounding mansions and palaces inspired by “made in Paris” architectural lines. Even today, almost 80 years later it surprises with its modern silhouette. The building is 120 meters high and houses 105 apartments throughout its 32 floors. From the beginning it was aimed at the upper middle class, so no effort was spared to create a feeling of space in an environment of highest quality luxury. Not surprisingly the building contained all technological innovations available at that time. All apartments were equipped with the central air-conditioning system – a big achievement at that time (ice room and circulating air did the job!). 12 ultra-modern Otis elevators provided private access to the apartments. Big gardens in many upper floors apartments offered magnificent views on the river, parks and the city. Swimming pools and central telephone system added to the extravaganza! View of the Kavanagh Building and the overshadowed Basilica of the Blessed Sacrament (Buenos Aires - Plaza San Martin). In front of the toll structure of the Kavanagh Building - the Marriott Plaza Hotel. To address the individual needs of inhabitants each apartment was designed with a different floor-plan and shape. All floors were made from a half-inch Slavonic oak while hardware was designed in white metal alloys. The 14th floor was entirely reserved for Corina Kavanagh – and it is the only floor in the entire building having just one apartment. This huge living area of 855 square meters (9,200 square ft) includes 6 bedrooms – each with luxury bathroom, dining area, in-house cinema, 3 private gardens giving 360 degrees view on the city, large open living area … all finished with exotic marble, precious wood and custom-made furnishing. In 1948 Corina’s apartment was sold to Mr. Henry Roberts for a staggering $5.9 million US. The Kavanagh Building received many national and international awards including one from the American Institute of Architects. In 1999 it was declared as a Heritage Architecture of Modernity by UNESCO and consequently a National Historical Monument of Argentina (as a result its wealthy occupants are exempted from paying municipal taxes what undoubtedly confirms that being rich is not such a bad thing!). Today the Kavanagh Building is owned by a British citizen - Lord Alain Levenfiche. 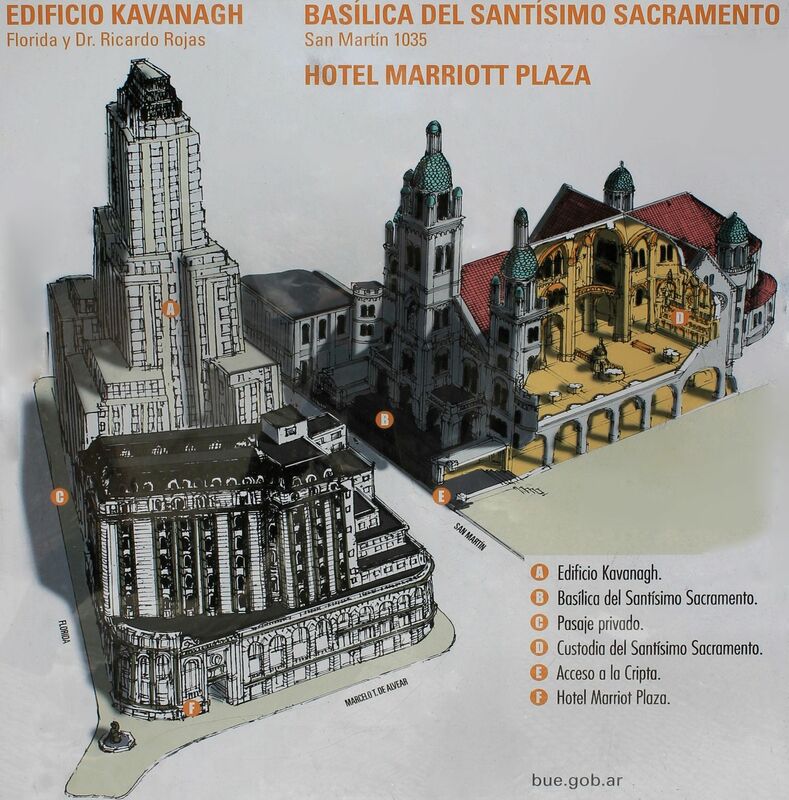 Visitors walking around the Plaza San Martin can quickly realize that the Kavanagh Building obstructs the view on another marvel – the Basilica of the Blessed Sacrament. Indeed the basilica is barely visible at the end of the curved narrow street called Pasaje Corina Kavanagh. Apparently this is not an accident or negligence of city administrators but rather a well planed scenario driven by unconsummated love, rejection and betrayal (nothing new in the history of human civilization). Well, rumor has it that Corina Kavanagh, a young red-hair Irish girl had a romance with one of Mercedes Anchorena’s sons. While Corina was very wealthy, she did not have “blue blood” in her veins (in other words was not from an aristocratic family). Considered as a “pariah”, Corina was rejected by the powerful Mother - Mercedes Castellanos de Anchorena. In many cases that will be the end of the story, but obviously the red-hair Corina was not an “average” girl with an ordinary temperament. At the first opportunity she bought the vacant lot in front of the basilica. Then in a “sweet” revenge she requested from architects to design a building that will completely block the view of the Anchorena’s private church (Basilica of the Blessed Sacrament) from the opposite side of the plaza where Anchorena’s palace was located. 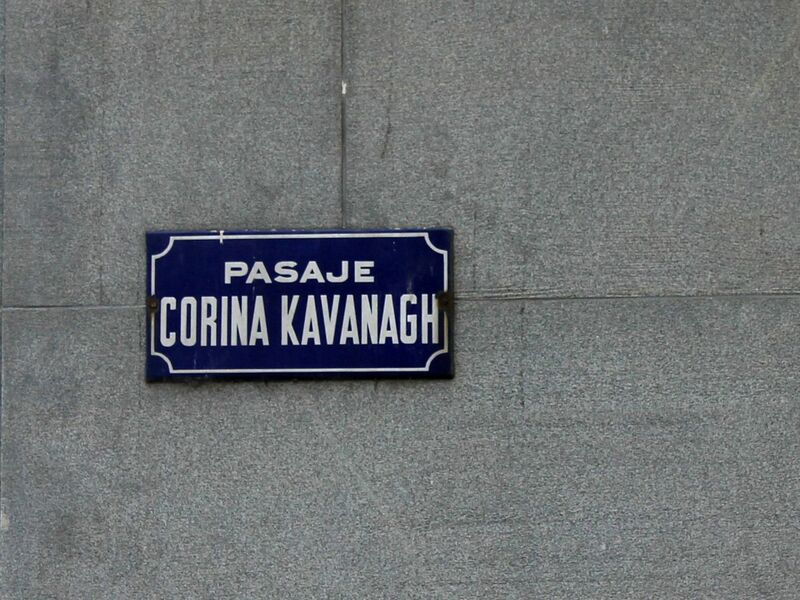 To make it even more “memorable” (if not humiliating) for Anchorenas, the narrow street they had to take going to the basilica was named Pasaje Corina Kavanagh. The moral of the story for boys – do not mess-up with red-hair Irish girls…. Some say that the story lacks credibility because Edificio Kavanagh was commissioned in 1934 – almost fourteen years after Mercedes passed away. Well, I would say – do not underestimate the determination of the humiliated young Irish girl. The Basilica was designed as a place of final rest for members of one of the most illustrious Argentinean family – Anchorena. And the fact that this beautiful church intended to witness the glory of Anchorenas and serving as the family burial ground is almost hidden from public eyes has quite strong and not only symbolic meaning….. Even time was not on the Anchorena side. Today El Palacio Anchorena in its reduced form (more than half of it was demolished) is known to everybody as El Palacio San Martin while Kavanagh Building still proudly dominates the plaza overshadowing the Basilica located behind it. And el Pasaje Corina Kavanagh – is still a main access road to the church. Corina Kavanagh (born in 1890) lived a very long life leaving this world at the age of 94. I wouldn’t suggest however that this was the result of the “sweet vengeance”, so please do not try to imitate her. Corina was only one and let’s keep it this way. (Some sources suggest that it was rather Corina’s daughter falling in love with Anchorena’s son. However the careful examination of the family tree shows that youngest Anchorena sons were slightly older than Corina so the “love affair” between them and Corina’s daughter was unrealistic). Originally it included 160 rooms and 16 suites each with central heating system and telephone access. The hotel was luxuriously furnished by British houses and decorated by marble sculptures by German Gustavo Eberlein and ceiling frescoes by Spanish painter Julio Vila y Prades. The hotel underwent two major “renovations” – one in 1940’s when the two new wings were added to the hotel significantly increasing its capacity. The latest refurbishment followed the purchase of the Plaza Hotel by the American hotel chain Marriott in 1994. Today, this five stars Buenos Aires hotel known as Marriott Plaza Hotel includes 270 rooms and 48 suites. OK, so we still have one more leg in our Plaza San Martin walking tour - the English Tower dominating the former Plaza Britannia (today called Plaza Fuerza Aerea Argentina).